RedFlagDeals.com iPhone-Optimized for Boxing Day! One of my favorite sites of all time is RedFlagDeals.com, the site where you find hot deals to buy things you really don’t need. 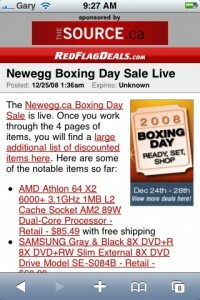 Anyways, if you’re Boxing Day shopping today and you want to find the best deals, RedFlagDeals.com is your only source where everything is consolidated and updated by the helpful community there. If you’re on your iPhone then things have gotten a bit easier. 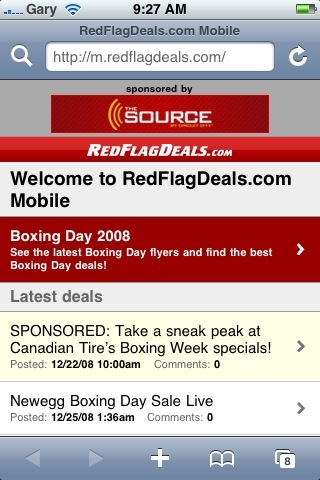 The RFD team has launched their iPhone-optimized mobile site for Boxing Day. All you have to do is head over to http://m.redflagdeals.com on your iPhone and you will find all the deals listed on the main page by store. It’s a great way to keep track of deals when you’re on the road. Waiting in line? Just launch the mobile website and you can view high resolution flyers right on your iPhone! 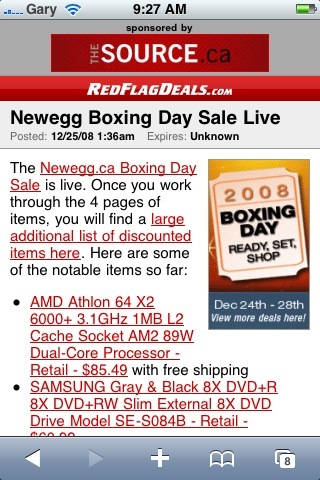 So there you have it, an optimized site for you to spend your hard earned dollars on Boxing Day. Let me know what online deals or in-store deals you will be jumping on today. Future Shop has some good deals right now so happy shopping!